Maples (Acer) are generally dependable for great fall color, and the few I have here are looking rather nice. 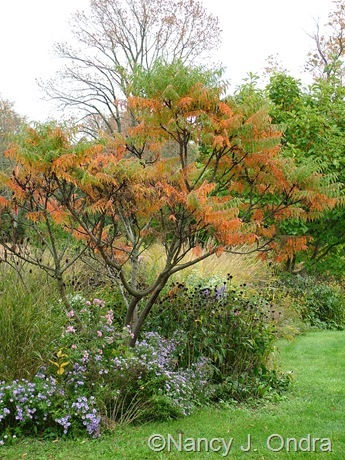 I wish I knew which Japanese maple (A. palmatum) this is. 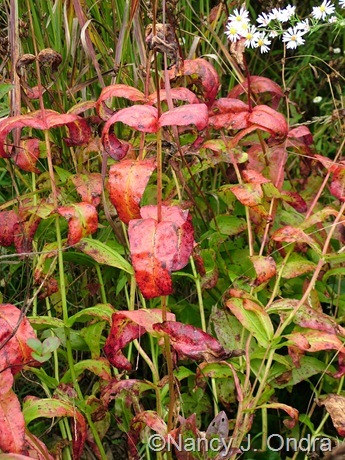 It comes out deep purple-red in spring, turns greenish red in summer, and then goes orange in fall. A garden visitor suggested that it might be ‘Kamagata’, but I don’t know the cultivars well enough to tell for sure. The one below, at least, had a label when I bought it: Oliver maple (A. oliverianum). A couple more unlabeled woodies from that same long-ago nursery-closing sale: above is some sort of doublefile viburnum (Viburnum plicatum), and below is – I think – shining sumac (Rhus copallina). 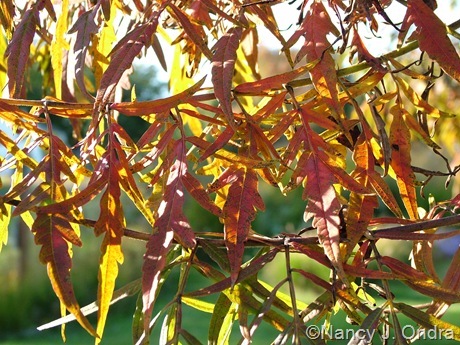 This one (above and below) I know for sure: cut-leaved staghorn sumac (Rhus typhina ‘Laciniata’). 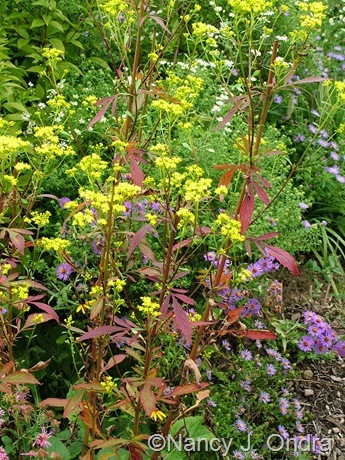 Above is ‘Grace’ smokebush (Cotinus). 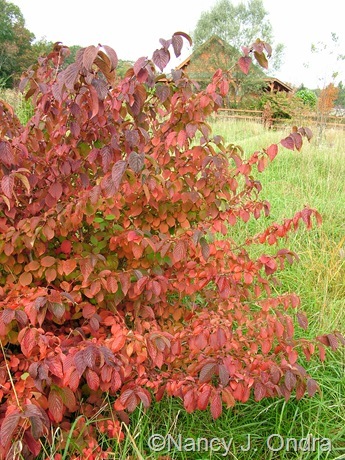 It’s not yet in brilliant red fall color, though; this is the normal color of its new growth. The orangey red parts are the shoots that pushed new growth when the rain started again in mid-August. 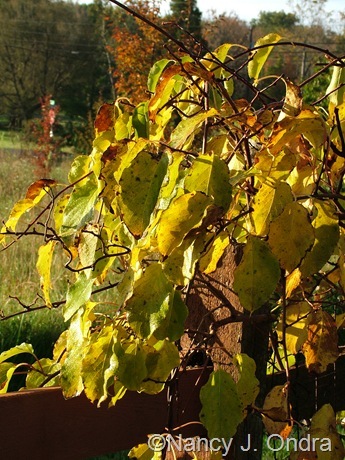 The ‘Little Honey’ oakleaf hydrangea (Hydrangea quercifolia) below started as a tiny rooted cutting about 6 years ago. It’s barely 2 feet tall now, but at least it’s still alive. Even little, it’s stunning in fall. Above, ‘Sunshine’ red-twig dogwood (Cornus sericea subsp. occidentalis); below, buttonbush (Cephalanthus occidentalis). Above, Chinese mahogany (Cedrela sinensis, a.k.a. Toona sinensis); below, hardy kiwi (Actinidia arguta). Beautyberries (Callicarpa) are best known for their brilliant purple fall berries, but their autumn color can be terrific too. 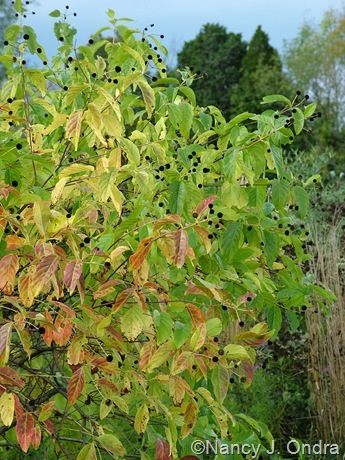 Above is ‘Issai’ beautyberry (C. dichotoma); below is ‘Spring Gold’ (also C. dichotoma). Crown Jewel Chinese dogwood (Cornus kousa ‘Madison’) is a plant I coveted for several years for its excellent fall color, and now I have one of my very own (acquired from Rare Find Nursery). It was worth waiting for. Southern bush honeysuckle (Diervilla sessilifolia), below, is generally in the red range of fall color, but it can take on shades of orange and yellow too. Above, ‘Gingerbread’ witch hazel (Hamamelis x intermedia). 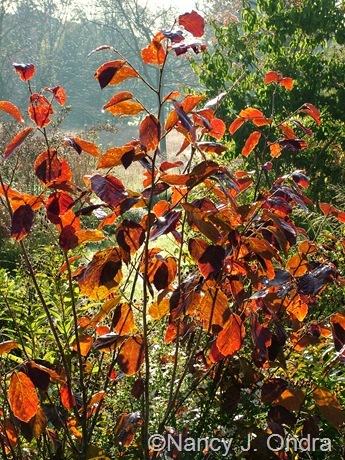 Below, ‘Henry’s Garnet’ Virginia sweetspire (Itea virginica). 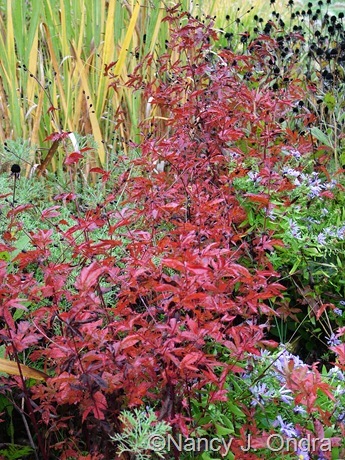 Above, Virginia creeper (Parthenocissus quinquefolia) and three-flowered maple (Acer triflorum) with an underplanting of Arkansas bluestar (Amsonia hubrichtii). 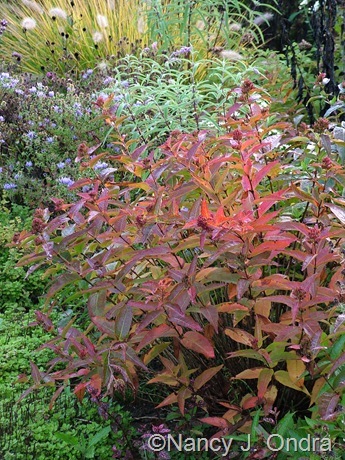 Speaking of Arkansas bluestar…there are also lots of perennials that offer interesting leaf color changes in fall, but for some reason, they don’t get anywhere near the attention that trees and shrubs get. 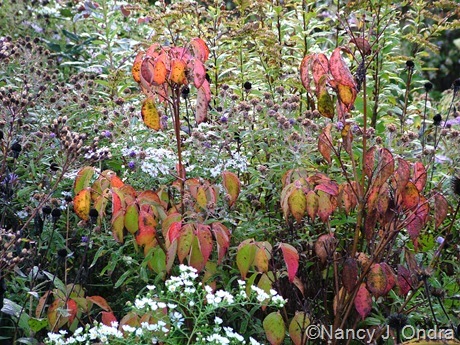 The bluestars shown above are just starting to turn, but in sunnier parts of the garden, many clumps of the same species are at peak color right now. 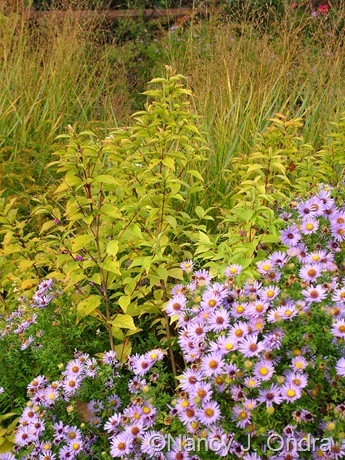 Above, ‘Raspberry Wine’ bee balm (Monarda); below, blackberry lily (Belamcanda chinensis) just starting to turn yellow. Above, American ipecac (Gillenia stipulata); below, scarlet rose mallow (Hibiscus coccineus). Above, butterfly weed (Asclepias tuberosa) out in the meadow; below, ‘Kobold’ spike gayfeather (Liatris spicata). Above, white Japanese burnet (Sanguisorba tenuifolia ‘Alba’). And below, the continuing star of the fall garden: golden lace (Patrinia scabiosifolia). Cut back after its first blooms darkened, it’s in bloom again as well as in fall color. Above, shredded umbrella plant (Syneilesis aconitifolia); below, foxglove penstemon (Penstemon digitalis). 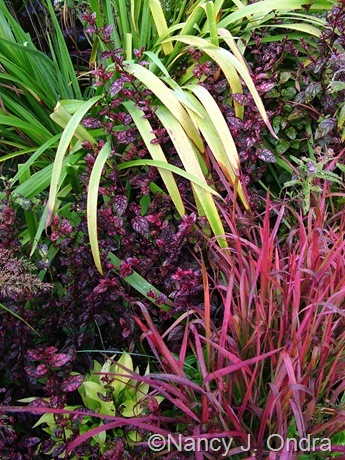 And a couple of fall pretties all together: ‘Gerald Darby’ iris (Iris x robusta), ‘Red Splash Select’ polka-dot plant (Hypoestes phyllostachys), a baby ‘Sun Power’ hosta, and Japanese blood grass (Imperata cylindrica ‘Rubra’). 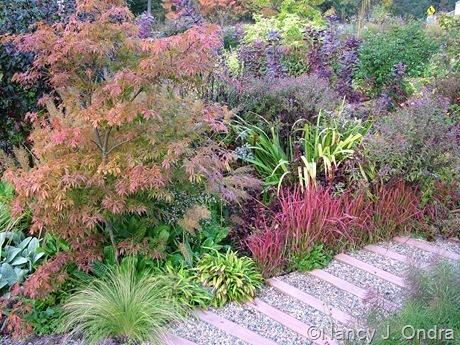 That rich red makes blood grass one of the showiest fall grasses color-wise, but many others are great in their own ways. Out in the lower meadow, clumps of Indian grass (Sorghastrum nutans) are finally seeding in from the field across the street. In the upper meadow, little bluestem (Schizachyrium scoparium) is coloring up, and so is big bluestem (Andropogon gerardii). 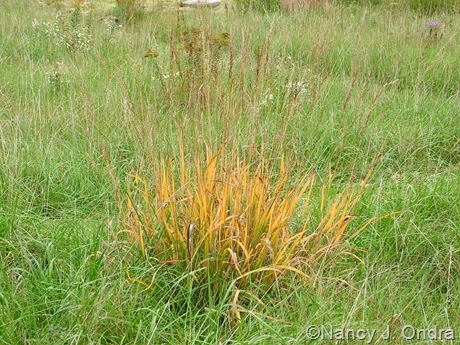 Frost grass (Spodiopogon sibiricus), above, is often described as having reddish to purplish fall color, but here, it usually turns golden yellow before quickly browning. 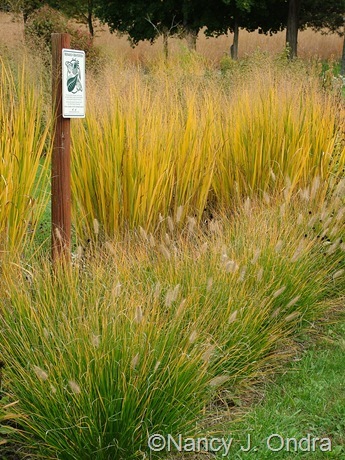 Below is frost grass again, with ‘Cassian’ fountain grass (Pennisetum alopecuroides) just starting to color up in the foreground. 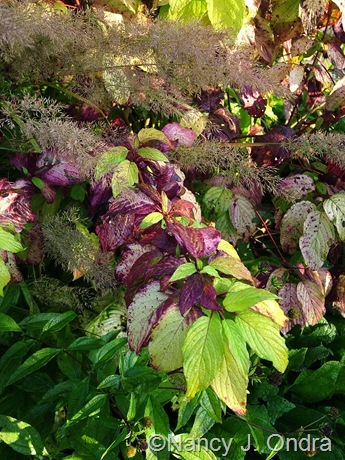 The ‘Cassian’ clumps shown above, growing in a nearby bed, haven’t even started to turn. 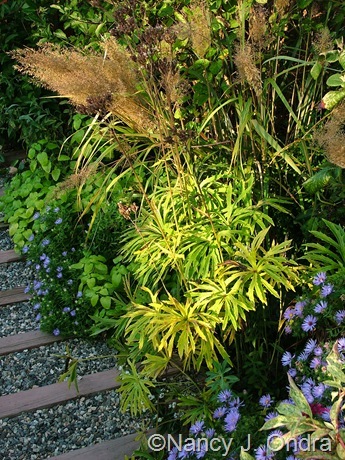 The ‘Morning Light’ miscanthus still looks fresh too. 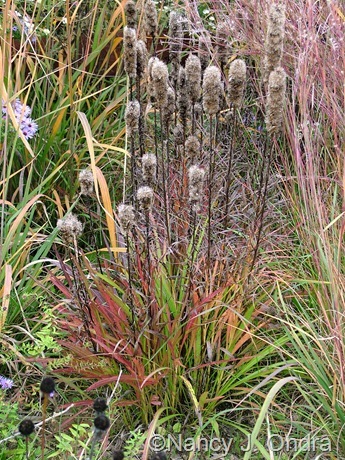 Flame grass (Miscanthus ‘Purpurascens’), though, is just about at its peak. ‘Skyracer’ purple moor grass (Molinia caerulea subsp. arundinacea), above, is looking quite nice, as is the ‘Cloud Nine’ switch grass (Panicum virgatum), below, growing a few feet away. Two more switch grasses, for good measure: above, ‘Huron Solstice’, and below, ‘Northwind’, behind more ‘Cassian’ fountain grass. 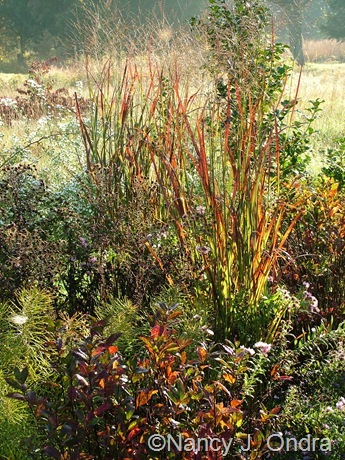 And to finish, ‘The Blues’ little bluestem, which has a wonderful way of looking coppery pink on dull days (above) and orangey red in bright sunshine. 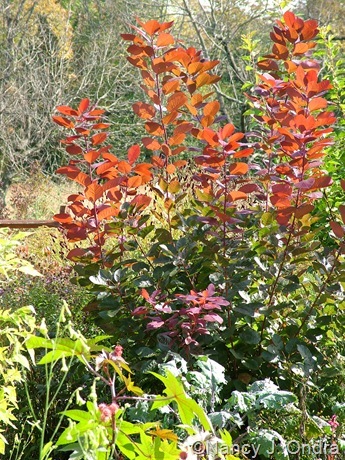 To see how fall is progressing in gardens elsewhere, check out the posts at The Fall Color Project 2011. So sweet colours Nancy… especially the pink and purples ones ! There certainly is a wide range of fall colors this year, and these don’t even include all the foliage that’s colorful all through the growing season. I’d originally planned to include some of the best of those as well, but I figured the post was plenty long enough. I hope you’re having a beautiful autumn too, Nicole. I sent your blog and website to my old high school friend (50 plus years ago) and she was absolutely delighted to read every word and is so pleased that someone gardens with her passion. She finds your garden to be a heavenly treat! you have kindly given me nicotiana seeds twice. Hey, Vickie. Thanks for getting me a new reader. I’ve been thinking about what I told you with the last batch of nicotiana seed: instead of direct-sowing it early in the spring, you might want to try waiting until July to sprinkle a small pinch in any bare spaces in your garden. I just collected more of “Ondra’s Green Mix” and the brown-flowered ones too, so let me know if you need more. Hi Gail! 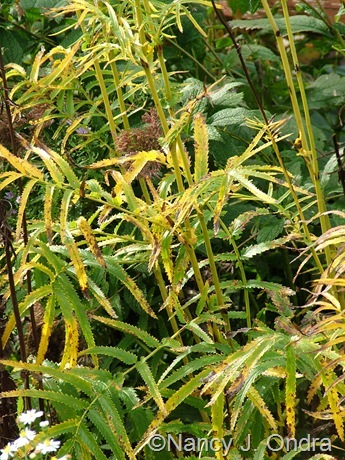 I was thinking of you when I chose the Gillenia/Porteranthus image because of your recent post. Such a pretty plant. Your fall color is gorgeous, Nan. 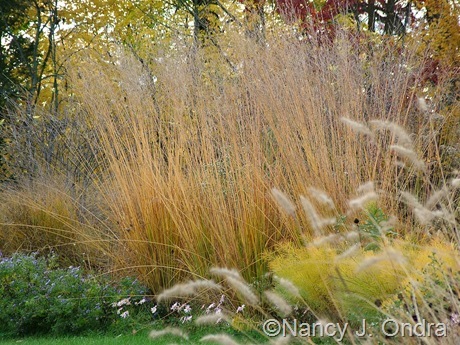 Even in our perennial beds, our fall color is a mere shadow of its usual self this year, which has been so disappointing! 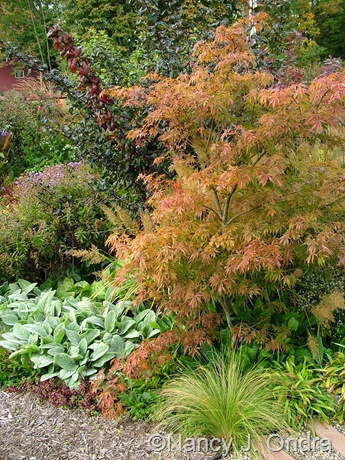 The maples are especially notable non-performers. Enjoyed your post! How sad, Cathy. Maybe because of the seemingly endless rains this fall? The usual great fall trees in the woods and along roadsides in this area – sassafras, maples, hickories, and the like – have pretty much been a dud, but somehow the plants right here have done all right. Well, you can look forward to next year, right? Oof! So many plants added to my “I NEEEEED THESE!” list! So inspirational! 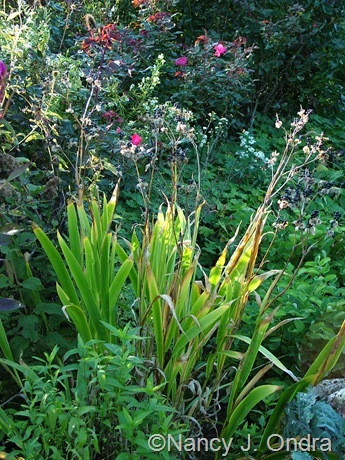 I am still in dire need to dig up a new ornamental bed… I have 5in. high ‘Little Bluestem’ in a little plastic container awaiting their final resting place! [purchased seed after seeing how beautiful they can be!] 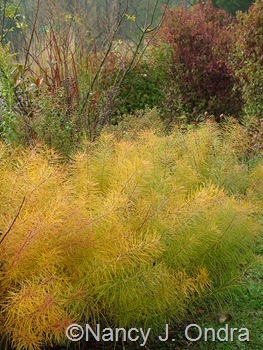 That, and with some Sea Oats I hope to have some wonderful grass structure next year in the garden! Goodness, and to pair that with that wonderful Oakleaf Hydrangea? Get busy digging, Donna! 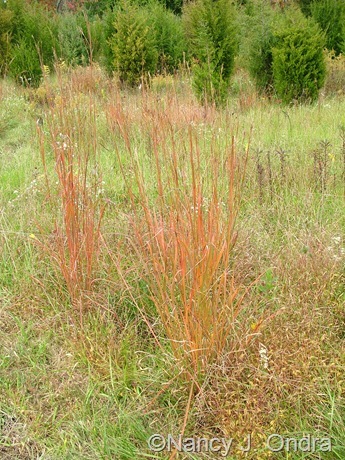 As much as I love the fall color of ‘The Blues’ little bluestem, I almost prefer the species clumps that come up on their own in the meadow, because they have such a range of coppery to rusty hues this time of year. They’d be lovely with the hydrangea, but I’m not sure that would be idea from a cultural standpoint, because they are happiest in full sun, while the hydrangea seems to need afternoon shade, at least. But, you could give it a try! Maybe use the grass to shade the hydrangea…? hee hee! I currently have a hydrangea [variety/cultivar unknown. It was a big box store rescue…] that sits in full sun… Oddly it hasn’t failed on me yet! But it will be moved soon – it’s getting too big! Hey, if it works for you, then go for it! I love the post Nan! That meadow has be envious. Looks like I’ll be spending some time propagating my switchgrasses for use on our hillside! The sumacs are always a showstopper. Our ‘Grace’ has finally put on some growth this year. The deer have nibbled it every year since I planted it but avoided it this year for some reason. I like how you’ve used the tall and short grasses together. 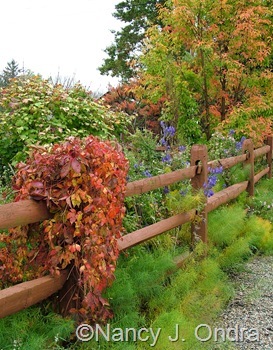 Thanks for the great post and joining in the Fall Color project! I’m so glad you decided to host again this year, Dave, and I’m delighted to finally take part in this year’s event. 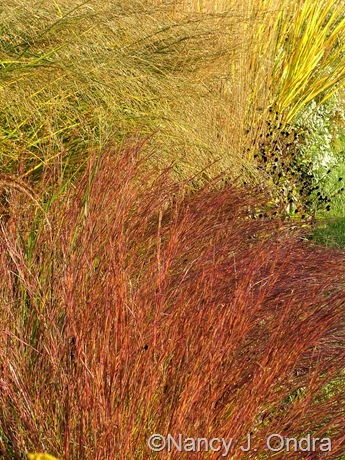 You’ll have no problem filling your hillside with switchgrasses once you get started, either from divisions or seeds. Thanks so much, Kim! The plants have really outdone themselves this year. It’s a good thing I was able to catch them at it now, because we’re finally due for frost this week, and maybe even snow – oh noooooo. 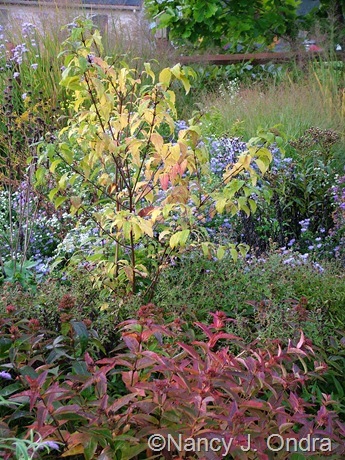 Just beautiful…your garden really shines in autumn! 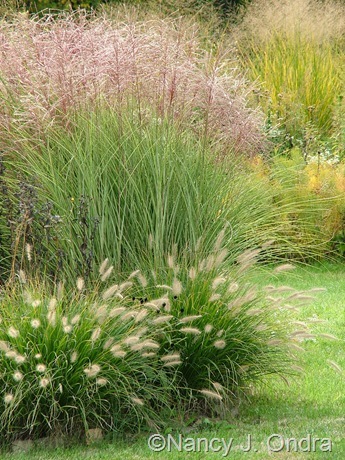 I love everything, but, of course, love the grasses most of all. 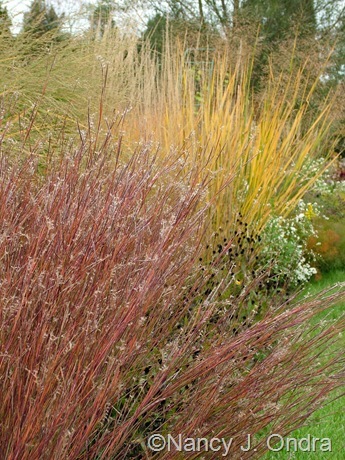 I’m utterly fascinate by just how many colors there are in Little Bluestem…it’s astounding. I recently went back home to the Midwest for a visit and was floored by all the amazing grasses…I don’t remember them being so numerous! 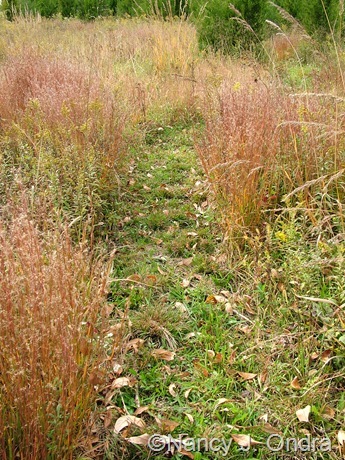 Little Bluestem, Big Bluestem, Panicum, Sorghastrum…it was amazing! 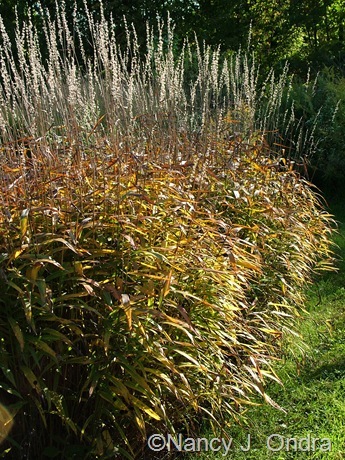 One thing I always come away from your blog with is the importance of massing…2 or 3 Panicum in a group look lovely, 10 look amazing! Grasses have a way of being part of the background for much of the growing season, then suddenly showing off this time of year, don’t they? 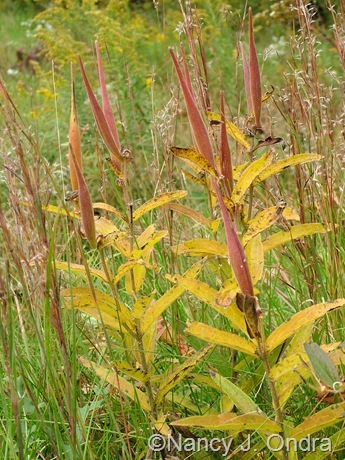 Each year, I swear that there’s more and more little bluestem in the meadow, and I’m sure I don’t remember seeing the big bluestem in there before. On the down side, I’m also finding that the fountain grass is seeding into the meadow, which is a bit disturbing. I just started noticing that last year, and there are easily a dozen clumps in there now – easy to see when they’re in fall color. Always something to learn with these things…. Just awesome, mouth-watering photos once again Nan. Thank you for taking us on this brilliant tour of your rainbow of autumn colors. I am inspired ! It’s a major stroke of luck that the weather here has cooperated in bringing out color in the garden and meadow, if not in many of the trees. I hope the fall season is progressing well in your part of the world, Barbara. Awesome, Nan. Bet this post took you a while. We grow many of the same things, of course, but I love that you focused some on perennials. 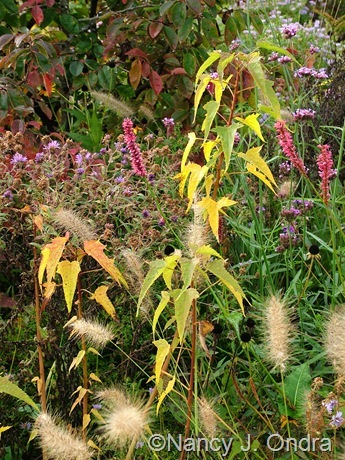 I love my liatris and zizia in autum, among many others, and in masses they are equal to the woody stuff. Why don’t I grow zizia? I think that’s one I need to add next year. Thanks for the reminder, Benjamin. I should have included a picture of Platycodon in the perennials section of this post, because it’s in its golden splendor now too. Splendid! Your garden is art Nan, no two ways about it. If I could paint I’d be on a plane with the art supplies begging for an afternoon visit. And how distracted I’d be ! I would probably end up wandering around oogleing while my paint congealed and my brushes solidified. You’ve definitely gotten to see the best of it here, Ks, if not in person. We’re skipping over light frost and heading right for freeze warnings tonight, so much of the splendor will be mush by this time tomorrow – sigh. Still, the grasses will stay, and the seedheads, so not all will be lost. Gee, I didn’t even realize that I’d left out Grasses. I should add it when I update the site this winter. Thanks for that reminder, John! Marketing definitely isn’t one of my strengths. All the plants looks absolytely stunning, but unfortanelly we can´t grow most of them here. 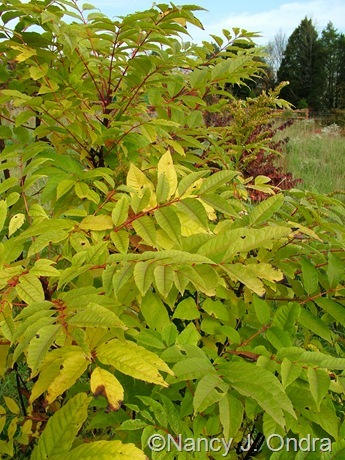 There are some exceptions, Rhus typhina ‘Laciniata’ for example. This one I had when I was living in Stockholm, there I gave a friend a rootplant (?) and she then gave me one when we moved here to Gotland. And now we have several, but it´s OK! 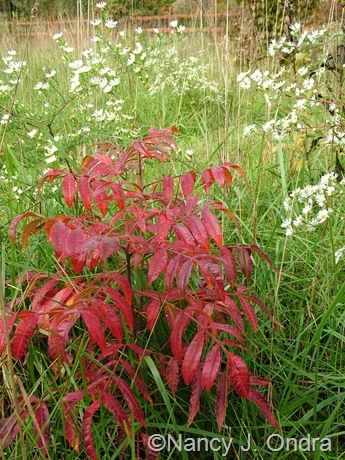 Oh yes, once you have one of those Rhus established, you have plenty, don’t you? I’m thinking of moving some of mine to the meadow next spring. Hope you have a great autumn, Susie! Beautiful photos yet again, Nancy. 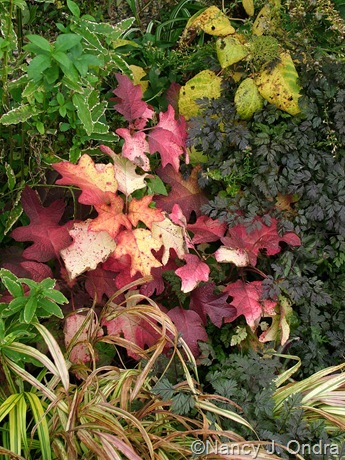 You’re right that many perennials sport lovely fall colors. But it’s the trees and shrubs that get all the glory. 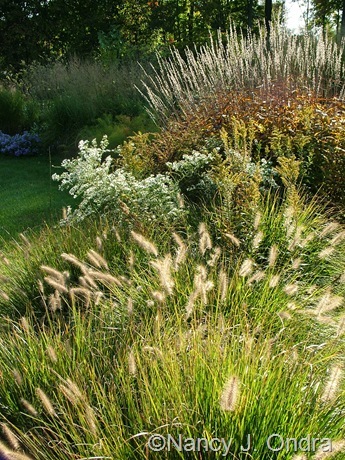 Love the grasses too. I appreciate you stopping by, Grace. It looks like fall is treating you well too, with lots of flowery goodness. Who said it was all about the blooms? 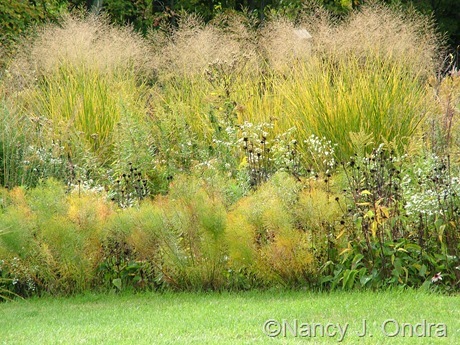 I am inspired to add more grasses to my garden beds after seeing how good these look. 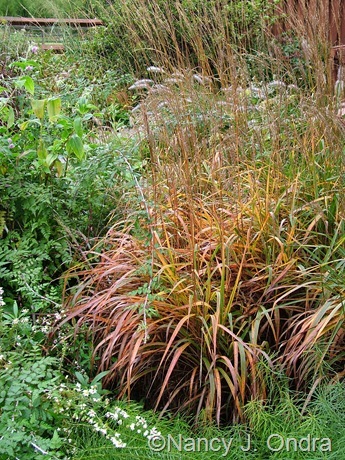 I have miscanthus ‘malepartus’ and muhly grass on the list already. 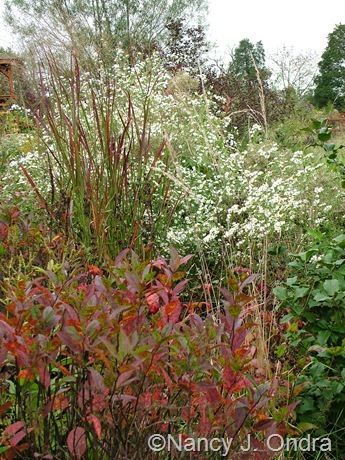 I am hoping the bluestems will do well for me here in TN and am also wanting to add Molinia ‘skyracer’. I did add a coralinium (sp?) 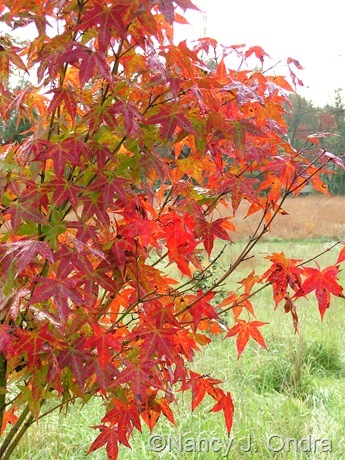 Jap maple this year and it is showing a lovely yellow gold colored leaf in contrast to its red bark. Once again I find myself studying the actual photos for clues about how to take a good picture… I always remember your comment about the ‘wow moments’ and try to look for those. Thanks for the great blog! Hey there, Kate. You’re so lucky to have muhly grass; that’s one I need to get established here again. 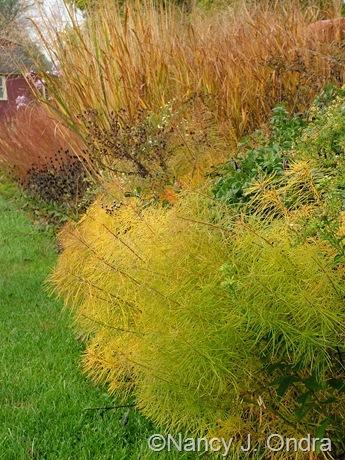 ‘Skyracer’ molinia is terrific too: so brilliant yellow this time of year, but also super for height and sound and movement earlier. Good luck with your new garden additions! Nan, on the first photo, i love this part of your garden. Each season is an explosion of colours. WONDERFULL ! I’d like to post this photo on my blog with your website adress. Thanks, Manuechao! I’d be honored if you wanted to include a link to this post on your site, but I’d ask that you not copy the actual photo. Hi Benjamin. 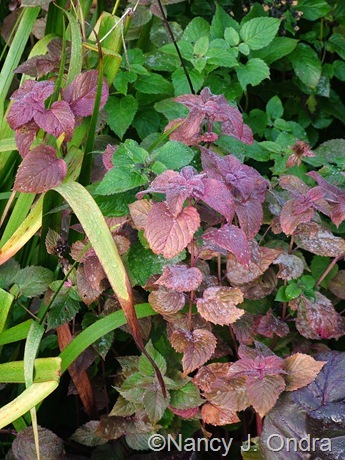 The fall color on the ‘Raspberry Wine’ monarda was a surprise; I don’t remember seeing that before. And you’re right – the spireas are spectacular now. I looked at your shop when you mentioned it on your blog; you have some lovely shots there. Good luck!